Moses soon faced a problem: the acquisition of enough land for a park in this densely populated area. Condemnation, the process by which the City may acquire private land for public purpose, was prohibitively expensive and fraught with legal difficulties, especially along this heavily industrialized waterfront. Moses arrived at an imaginative solution. To provide more parkland, he built a 10-foot wide concrete extension to Manhattan’s eastern shoreline spanning 20 blocks in length. 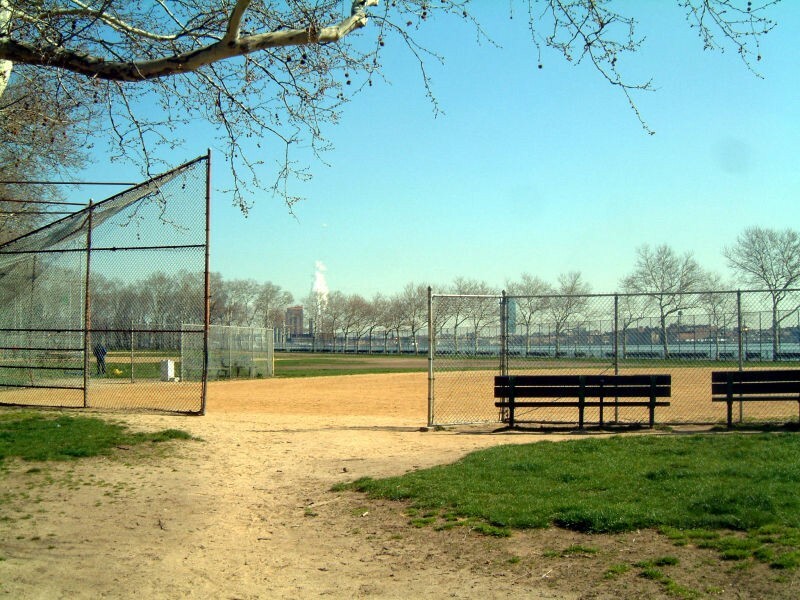 The combination of the added platform and Moses’s energetic legal wrangling was enough to secure the needed land, and in 1939, East River Park — the Lower East Side’s largest open space — opened alongside the FDR Drive. 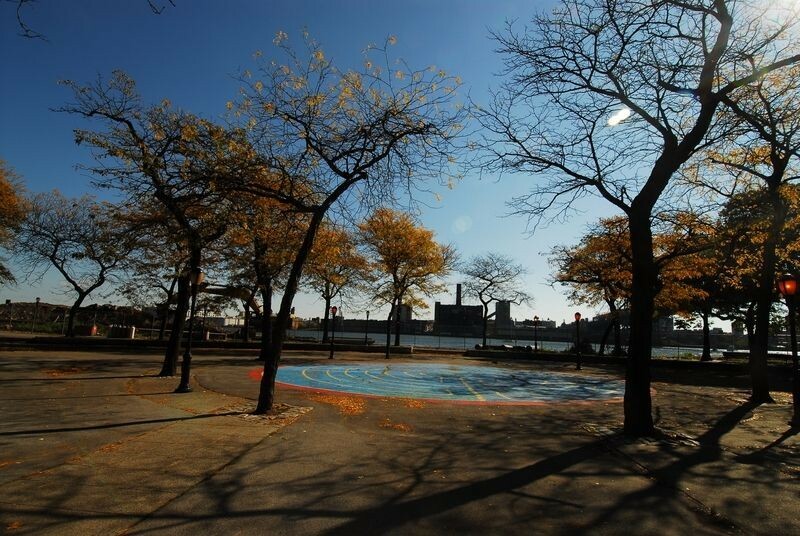 East River Park has undergone a great many changes since then. In 1949, when the FDR Drive was widened, a portion of the park between Montgomery and Jackson Streets was eliminated. South Street was extended in 1963, protruding onto another 30-foot section of the park. In 1951, Parks built the 10th Street pedestrian overpass above the FDR Drive, connecting the park with East Village residents, and with residents of the neighboring Lillian Wald Houses. In 1941, an amphitheater was built in the park, along with an adjacent limestone recreational building, as part of an urban renewal project for the Lower East Side. Joseph Papp (1921-1991), founder of Shakespeare in the Park and the Public Theater, staged Julius Caesar there in 1956. During the 1950’s, the amphitheater was the site of frequent free Evening-in-the-Park concerts. Local schools held their graduation ceremonies there, and the Group of Ancient Drama performed the Greek classics (gratis). In 1973, however, the amphitheater closed due to budget cuts. Vandals attacked the neglected theater and by 1980 it was unusable. The East River waterfront has played a crucial role in the development of New York City. Well before the Hudson River became a depot for the shipping industry, the East River provided a safe harbor for numerous shipping interests in the early days of colonial settlement. By 1825, the area was marked by an active shipbuilding industry, boisterous masses of sailors, and a number of active municipal waterfront markets. In the mid-19th century, as sea trade moved to the deeper channels of the Hudson River, docks gave way to factories, and then, in the late 19th century, to tenements. By the time Moses developed his plan for the park, the southern East River waterfront was dotted with slaughterhouses, glass factories, power stations, and railroad yards.